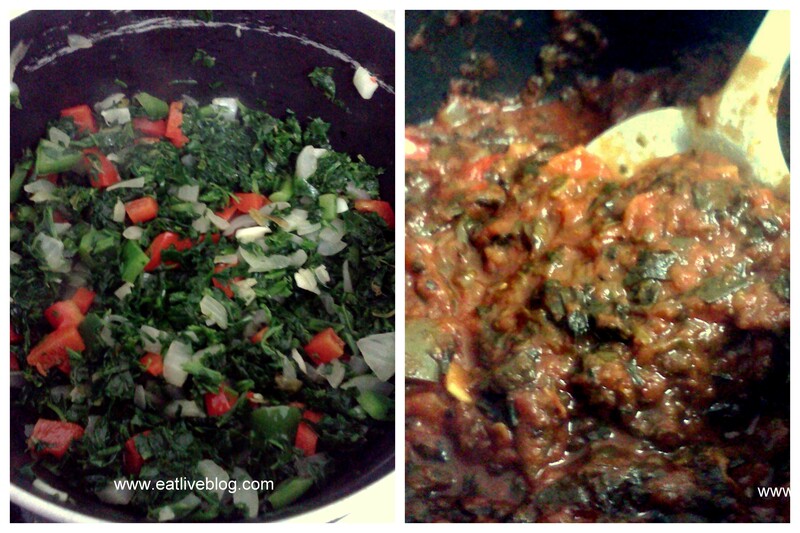 We are always looking for easy ways to add veggies to our meals. 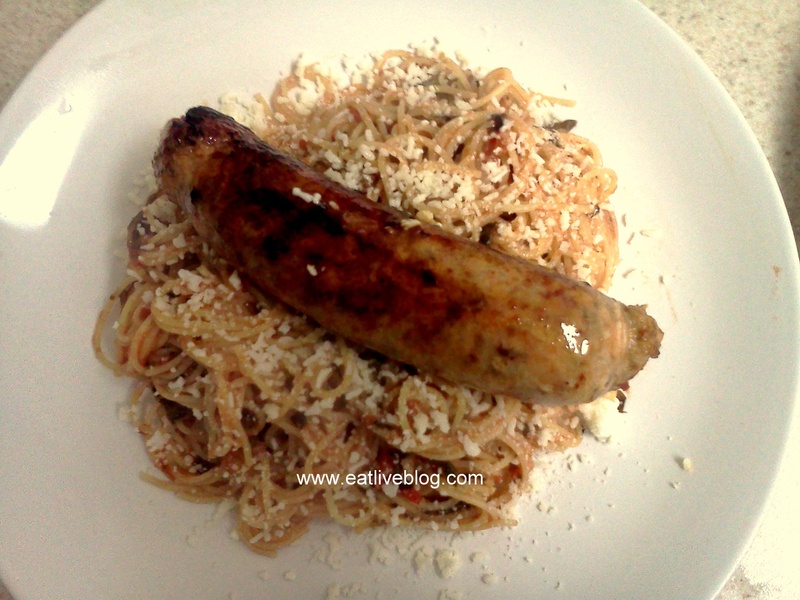 This spaghetti sauce is one of my very favorite ways! This sauce is absolutely loaded with good-for-you veggies, while disguising itself as a simply delicious sauce. Serve this sauce over protein enhanced pasta, veggie pasta, brown rice, a baked potato, in a pita….there is no limit to what you can do with it. If you are looking for an added protein punch, brown up some Morningstar Farms crumbles and add them to the sauce. This makes it take on the texture of a meat sauce, and can even double as a vegetarian sloppy joe! Cover and allow to simmer for at least 20 minutes. If simmering longer, make sure to stir often and add water if the sauce gets too thick. 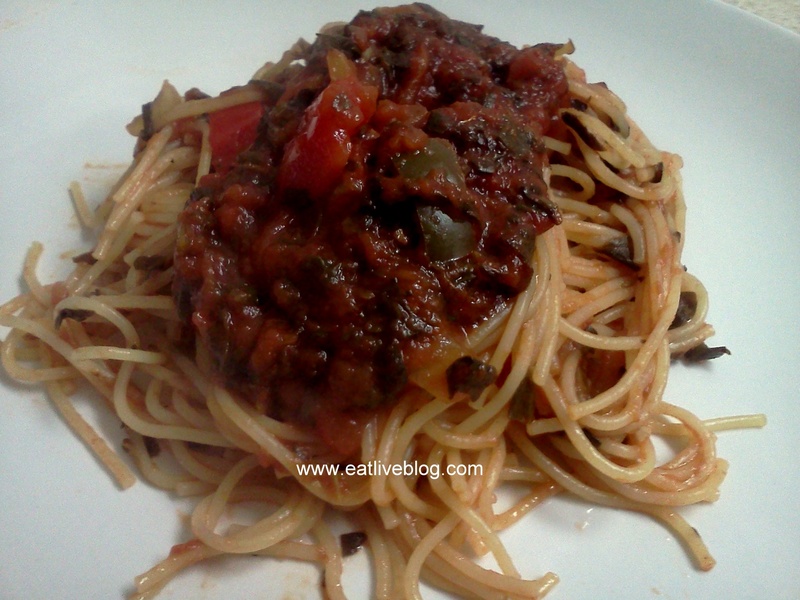 This entry was posted in Recipes and tagged healthy, hide vegetables, Morningstar Farms, pasta, recipe, sauce, soy, soy crumbles, spaghetti sauce, spinach, vegan, vegetarian by reneeh. Bookmark the permalink. I have always used red wine in my sauces, that way I don’t have to add sugar. My mom had a cool trick she would put a small can of no sugar added crushed pineapple in it’s own juice in and it never had an acidic taste. (she didn’t like to use wine in her sauce). She had the best sauce ever. I love the pineapple idea Michelle! Ryan doesn’t like wine in sauce either, even though this one had the smallest amount so it wasn’t all that detetctable. I will definitely try the pineapple next time! Haha!! It is SO true!! Yum, I love the idea of putting this on almost everything and anything! Oh this looks tasty (I’ll never get my fiance to touch spinach though) and I loved how you served it in not so traditional ways… with the chicken sausage. I haven’t had those Morning Star crumbles in ages… I remember a really health conscious friend made me burritos with them back in college. So good! I love using the crumbles in tacos and spaghetti sauce, both come out fabulously! I love everything about this! I bet this would be great for the slow cooker too! Veggie-loaded pasta is awesome. I haven’t used white wine in pasta sauce, I will try it soon! Looks great. I am going to try adding spinach to my sauce next time. You should really consider adding a couple carrots diced to this recipe. I always use them in my tomato sauce because they add a natural sweetness and go perfectly with the tomato sauce. Also, if you are not a big wine drinker…try a splash of cognac in your tomato sauces instead of wine. A little goes a long way and it keeps forever in the pantry. Thanks Erin! We have tried the carrots before and are not fans. But the cognac is a great idea! Fantastic! This looks like a great recipe for when my vegetarian friend comes and I would love it too!!!! This recipe is a great way to sneak in veggies! The kids will never know they are eating healthy. Thanks for the great recipe! Thanks Shawna! And that lasagna sounds amazing!